Introduction: Drugs causing ureteral relaxation are used for medical expulsive therapy (MET) for stones. 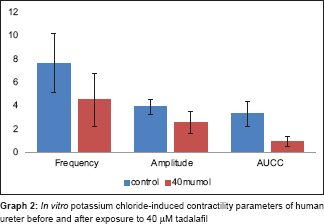 We investigated the in vitro ability of tadalafil to cause relaxation of potassium chloride (KCl)-induced contractions of isolated human ureteral tissue. Materials and Methods: Eight grossly normal proximal ureteral tissues were collected from the radical and donor nephrectomy specimen. The standard organ bath protocol was followed. Ureteral contractions were induced with 80 mM KCl before and after exposure to tadalafil. 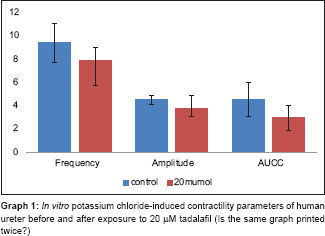 Results: The median amplitude and frequency of KCl-induced contractions and the median area under the contractility curve (AUCC) after exposure to 20 μM tadalafil showed significant reductions compared to that of before exposure to tadalafil (7.87 cm, 3.79/min, and 2.98 cm2, respectively, versus 9.37 cm, 4.48/min, and 4.50 cm2, respectively; P = 0,026, 0.008, and 0.008, respectively). After exposure to 40 μM tadalafil, the median amplitude and frequency of KCl-induced contractions and AUCC (4.50 cm, 2.56/min, and 0.92 cm2, respectively) showed significant reductions compared to that of before exposure to tadalafil (7.62 cm, 3.88/min, and 3.32 cm2, respectively; P = 0.008, 0.016, and 0.008, respectively). However, reductions in the parameters after exposure to 20 μM and 40 μM tadalafil were similar (P = 0.065, 0.195, and 0.130, respectively, for median amplitude, frequency, and AUCC). Conclusion: Tadalafil reduces KCl-induced contractions of isolated human ureteral tissue in vitro. No incremental relaxations in contractions occurred by increasing the dose of tadalafil from 20 μM to 40 μM. Ureteral colic is one of the most common urological emergencies. Apart from the size and location of the stone and the anatomy of the ureter, ureteral smooth muscle spasm is an important factor that determines the spontaneous passage of the stone.,, Drugs which produce ureteral relaxation have been used for medical expulsive therapy (MET) for ureteral calculi. Tamsulosin is the most commonly used drug for MET. Its action is site specific depending on the α-1 adrenergic receptor concentration. A recent study by Pickard et al. has questioned its role. There has been an increasing interest in the use of phosphodiesterase-5 (PDE-5) inhibitors in MET. Tadalafil, a PDE-5 inhibitor, has been used in combination with tamsulosin and has shown promising results. It acts by a nitric oxide/cyclic guanosine monophosphate (cGMP) signaling pathway of smooth muscles, inhibiting the degradation of cGMP, thus resulting in higher levels of intracellular cGMP., cGMP is an important second messenger in intracellular signaling and causes ureteral smooth muscle relaxation. Reduction in ureteral smooth muscle tension has been seen with vardenafil, sildenafil, and tadalafil. 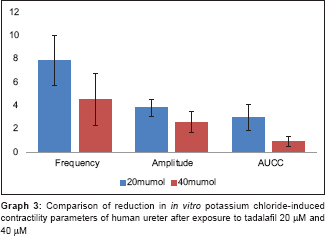 Only a few in vitro studies have assessed the response of human ureteral muscles to tadalafil., This study aimed to investigate the ability of tadalafil to relax the human ureter in vitro. Approval from the institutional review board (IRB No: 9460/05.06.2015) and informed written consent from all patients whose ureter was used for the study were obtained. A total of 8 ureteral tissues (5 from radical nephrectomy specimens and 3 from live donor nephrectomy) were collected from patients after getting informed consent. Ureteral tissues of about 4 cm lengths were excised from macroscopically normal ureters during surgery and were immediately placed in freshly prepared mammalian ringer solution. Specimens were transported to the pharmacology laboratory from the operating room within 1 h after specimen retrieval, maintaining proper ambient temperature. Ureters which had gross inflammation or were dilated or involved with tumor were excluded from the study. All the salts required to prepare the mammalian ringer solution were purchased from Fischer chemical limited, Guangzhou, China. Tadalafil (Code No: CAS-171596-29-5) was purchased from Santa Cruz Biotechnology, USA. All the fine chemicals used in the study were obtained from Qualigens, Mumbai, India. We used potassium chloride (KCl) to induce contraction in the ureteral tissue, as it has been used since a long time to artificially activate smooth muscle by a highly reproducible mechanism that works through the activation of calcium channels leading to increases in cytosolic-free Ca2+ and activation of myosin light-chain kinase followed by contraction. KCl and tadalafil were dissolved in double-distilled water or dimethyl sulfoxide and made into stock solutions. A total of 7 ureteral tissues were used in a pilot study to assess the effective concentration of drug for tissue response, time interval between adding the drugs into organ bath, and adequate length of ureter required. Separate ureteral tissues were used for the final study, and the parameters obtained from the pilot study were not used for the final statistical analysis. After reaching the laboratory, periureteral tissue was dissected out and 2 cm of human ureteral tissue was prepared for the study. A Dale's organ bath was used for the study. Ureteral tissue was mounted in a 30 ml organ bath and continuously aerated with oxygen. The organ bath chamber contained mammalian ringer solution which was constituted of 9 g of NaCl, 0.42 g of KCl, 0.24 g of CaCl2, 0.5 g of NaHCO3, and 1 g of dextrose dissolved in 1000 ml of distilled water (unadjusted pH). The temperature of the organ bath medium was maintained at 37°C. A Physiograph was used for the study with 50 Hz filter and 100 mV/cm sensitivity. Speed limit of the Physiograph was set at 0.25 mm/s. First, 0.5 g of pretension was applied to the tissue and was allowed for stabilization for 30 min without any manipulation. Once the stable resting tone had been reached, ureteral contractions were induced by adding 80 mM KCl to the organ bath medium with a contact time of 90 s, and the baseline ureteral contractions were recorded. The chamber was then washed four times every 5 min for the tissue to return to the stable resting tone. After a stable tone had been obtained again, the ureteral tissue was exposed to 20 μM tadalafil for a contact time of 5 min. Contractions were again induced by adding 80 mM KCl to the tadalafil medium and the response was observed for 90 s.
The chamber was again washed to clear tadalafil and KCl. Then, 80 mM KCl was added to induce baseline contractions once again which were considered as control for the next dose of tadalafil (40 μM). The chamber was washed again four times every 5 min. Once the tissue had achieved a stable resting tone, it was exposed to 40 μM tadalafil for 5 min, followed by the induction of contractions by adding 80 mM KCl. SPSS Statictics for Windows, version 18.0 (SPSS Inc., Chicago, Ill., USA) was used for the data analysis. Significance level was set at 5% to compare the outcomes between the groups. 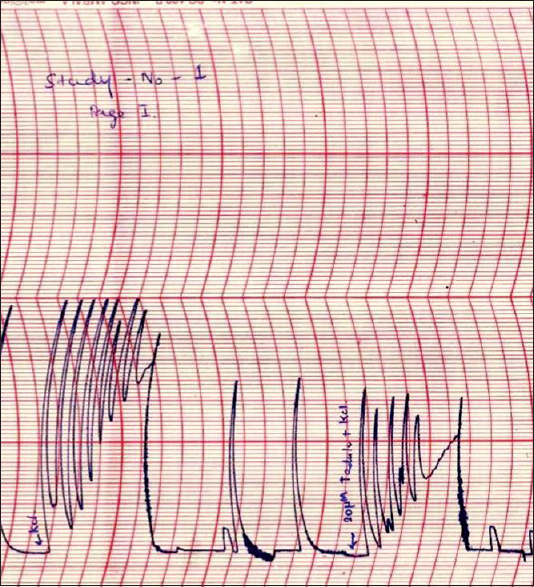 Median amplitude, median frequency, and median area under the contractility curve (AUCC) for KCl-induced contractions before and after exposure to different concentrations of the tadalafil were measured and analyzed using the Wilcoxon signed-rank test. The differences in the outcomes after exposure to different concentrations of tadalafil were analyzed using Mann–Whitney U-test. Ureteral contractions were induced with 80 mM KCl, and three contractility parameters were measured: the amplitude, frequency, and AUCC. All the ureteral specimens responded well to KCl. A few ureters showed spontaneous contractions after mounting in organ bath medium until the completion of the study. All three KCl-induced contractility parameters showed a statistically significant reduction after exposure to 20 μM tadalafil. The median amplitude and frequency of KCl-induced contractions and the median AUCC after exposure to 20 μM tadalafil (7.87 cm, 3.79/min, and 2.98 cm2, respectively) showed significant reduction compared to that of before exposure to tadalafil (9.37 cm, 4.48/min, and 4.50 cm2, respectively; P = 0,026, 0.008, and 0.008, respectively) [Table 1], [Figure 2] and [Graph 1]. Similarly, after exposure to 40 μM tadalafil, the median amplitude and frequency of KCl-induced contractions and AUCC (4.50 cm, 2.56/min, and 0.92 cm2, respectively) showed significant reduction when compared to that of before exposure to tadalafil (7.62 cm, 3.88/min, and 3.32 cm2, respectively; P = 0,008, 0.016, and 0.008, respectively) [Table 2], [Figure 3] and [Graph 2]. However, when the reductions in KCl-induced contractility parameters after exposure to 20 μM and 40 μM tadalafil were compared, no statistically significant difference was seen (P = 0.065, 0.195, and 0.130, respectively, for median amplitude and frequency of KCl-induced contractions and AUCC) [Table 3] and [Graph 3]. A study by Gratzke et al. investigated the effect of sildenafil, vardenafil, and tadalafil on isolated human ureteral segment and measured the levels cyclic adenosine monophosphate (cAMP) and cGMP by specific radioimmunoassay after administration of drugs into the organ bath. They were able to show a significant dose-dependent reversal of the ureteral tension induced by KCL. Among the tested PDE-5 inhibitors, vardenafil caused more accumulation of the cGMP than other PDE-5 inhibitors. Our results also showed a statistically significant reduction in ureteral contractility measured by the amplitude and frequency of contractions of isolated ureteral tissue and the AUCC with different concentrations of tadalafil compared to the controls [Table 1] and [Table 2]. Gratzke et al. and Liatsikos et al. showed that there was a dose-dependent response with PDE-5. The maximum concentration of PDE-5 inhibitors used was 10 μM in both the studies. In our study, increasing the concentration of tadalafil from 20 μM to 40 μM did not show a statistically significant incremental reduction of amplitude, frequency, and AUCC proportionally [Table 3]. Probably, the high affinity of tadalafil for intracellular receptors causes the slow dissociation of the drug from the receptors. Hence, the alteration of concentration of the drug may not give the effect through the receptor–ligand complex.,,, This effect may be significant clinically as increasing the dose may cause more adverse effects, rather than benefit. However, further studies are required to prove this effect. All in vitro studies have inherent drawbacks. Tissue viability is the most important issue that requires attention. This drawback can only be minimized and cannot be completely eliminated. In our study, all the possible precautions were taken to minimize the tissue damage. 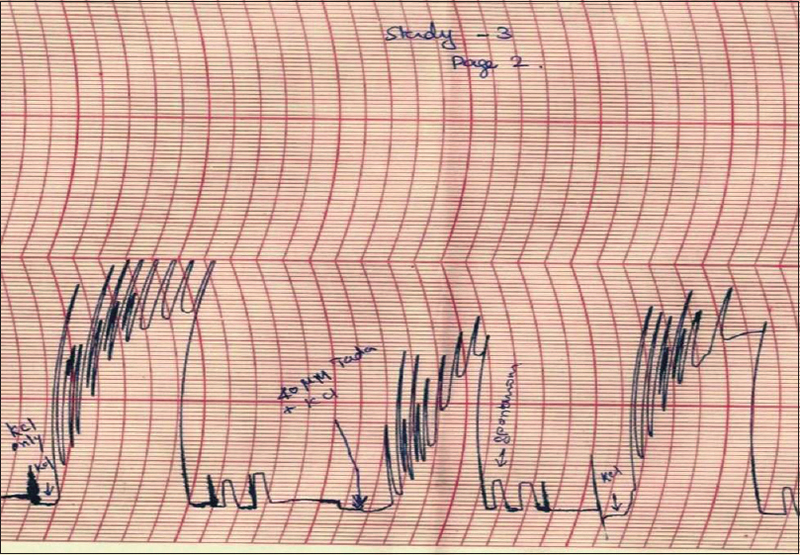 Precautions were taken during the study to avoid excess tissue handling: tissue was transported in the physiological solution, which was prepared freshly on the day of the study; the study was started within an hour after retrieval from the patient; ureteral movement during the dissection (Kelly's sign) was present in all the tissues just before mounting on the organ bath medium; KCl solution was freshly prepared on the day of the procedure, so the possibility of contamination was minimized; there is frequent washing of the organ bath chamber with mammalian Ringer solution in between the drug administration to washout the metabolites, which may harm the tissue; tadalafil stock solution was prepared and stored at −20°C as per the recommendation of the pharmaceutical company; at the end of the study, KCl was added into the organ bath medium and ureteral contractions were noted in all the ureteral samples; and all ureteral studies were completed in 4 h. The measurement of cyclic nucleotides, cAMP and cGMP, would have been more informative for the present study. Further, proximal ureteral tissue was used for the study. MET is generally indicated for distal ureteral calculi. The results from studies using proximal ureteral tissue may not be generalized to distal ureter. Tadalafil reduces the KCl-induced contractions of isolated human ureteral smooth muscle in vitro. No incremental relaxation of KCl-induced contractions occurred by increasing the dose of tadalafil from 20 μM to 40 μM. Prospective clinical trials are warranted to prove the applicability of tadalafil in MET. Coll DM, Varanelli MJ, Smith RC. Relationship of spontaneous passage of ureteral calculi to stone size and location as revealed by unenhanced helical CT. AJR Am J Roentgenol 2002;178:101-3. Roberts WW, Cadeddu JA, Micali S, Kavoussi LR, Moore RG. Ureteral stricture formation after removal of impacted calculi. J Urol 1998;159:723-6. Pickard R, Starr K, MacLennan G, Lam T, Cameron S, Norrie J, et al. Medical expulsive therapy in adults with ureteral colic: A multicentre, randomised, placebo-controlled trial. Lancet 2015;386:341-9. Jayant K, Agrawal R, Agrawal S. Tamsulosin versus tamsulosin plus tadalafil as medical expulsive therapy for lower ureteric stones: A randomized controlled trial. Int J Urol 2014;21:1012-5. Gratzke C, Uckert S, Reich O, Schlenker B, Tilki D, Seitz M, et al. PDE5 inhibitors. A new option in the treatment of ureteral colic?. Urologe A 2007;46:1219-23. Vlachopoulos C, Terentes-Printzios D, Ioakeimidis N, Rokkas K, Stefanadis C. PDE5 inhibitors in non-urological conditions. Curr Pharm Des 2009;15:3521-39. Gratzke C, Uckert S, Kedia G, Reich O, Schlenker B, Seitz M, et al. In vitro effects of PDE5 inhibitors sildenafil, vardenafil and tadalafil on isolated human ureteral smooth muscle: A basic research approach. Urol Res 2007;35:49-54. Kühn R, Uckert S, Stief CG, Truss MC, Lietz B, Bischoff E, et al. Relaxation of human ureteral smooth muscle in vitro by modulation of cyclic nucleotide-dependent pathways. Urol Res 2000;28:110-5. Ratz PH, Berg KM, Urban NH, Miner AS. Regulation of smooth muscle calcium sensitivity: KCl as a calcium-sensitizing stimulus. Am J Physiol Cell Physiol 2005;288:C769-83. Pozzan T, Rizzuto R, Volpe P, Meldolesi J. Molecular and cellular physiology of intracellular calcium stores. Physiol Rev 1994;74:595-636. Ückert S, Kuczyk MA, Oelke M. Phosphodiesterase inhibitors in clinical urology. Expert Rev Clin Pharmacol 2013;6:323-32. Puvvada S, Mylarappa P, Aggarwal K, Patil A, Joshi P, Desigowda R, et al. Comparative efficacy of tadalafil versus tamsulosin as the medical expulsive therapy in lower ureteric stone: A prospective randomized trial. Cent European J Urol 2016;69:178-82. Kc HB, Shrestha A, Acharya GB, Basnet RB, Shah AK, Shrestha PM, et al. Tamsulosin versus tadalafil as a medical expulsive therapy for distal ureteral stones: A prospective randomized study. Investig Clin Urol 2016;57:351-6. Liatsikos E, Kyriazis I, Neuhaus J, Kallidonis P, Georgiopoulos I, Franz T, et al. Direct effects of vardenafil on the ureter:In vitro investigation and potential clinical applications of intralumenal administration. J Endourol 2013;27:1400-4. Silhavy TJ, Szmelcman S, Boos W, Schwartz M. On the significance of the retention of ligand by protein. Proc Natl Acad Sci U S A 1975;72:2120-4. Belfiore A, Costantino A, Frasca F, Pandini G, Mineo R, Vigneri P, et al. Overexpression of membrane glycoprotein PC-1 in MDA-MB231 breast cancer cells is associated with inhibition of insulin receptor tyrosine kinase activity. Mol Endocrinol 1996;10:1318-26. Willis RC, Furlong CE. Purification and properties of a ribose-binding protein from Escherichia coli. J Biol Chem 1974;249:6926-9. Francis SH, Morris GZ, Corbin JD. Molecular mechanisms that could contribute to prolonged effectiveness of PDE5 inhibitors to improve erectile function. Int J Impot Res 2008;20:333-42.